Never in the history of royalty has a monarch reached a 70th wedding anniversary. A few have come quite near, but that coveted Platinum milestone is reached today for the first time by The Queen and The Duke of Edinburgh, who were married at Westminster Abbey on the morning of 20th November 1947 by the Archbishop of Canterbury, Geoffrey Fisher. She has previously paid tribute to him for being her “strength and stay all these years”; he has praised her for possessing “the quality of tolerance in abundance”. And in that model of mutual support and perpetual forgiveness lies the secret of a successful marriage. They are known to have had their stand-up rows, their times of closed-mouth indignation, stubbornness and resentment. But they have remained steadfast as they promised God and each other that they would – for better or for worse, for richer, for poorer, in sickness and in health – until death do them part. Their unbreakable covenant of love, symbolic of God’s unbreakable covenant sealed with the blood of Christ, is a remarkable testimony in an age of fickleness, infidelity and quick divorce. ‘Husbands, love your wives, even as Christ also loved the church, and gave himself for it,’ wrote St Paul to the Ephesians (5:25). It is an impossible human task, of course, but the one-flesh character of marriage is certainly a little easier when there are three in the union, and one of them is God. Nevertheless let every one of you in particular so love his wife even as himself; and the wife see that she reverence her husband (vv28-30). What a wonder it is when the Supreme Governor of the Church of England leads by example, upholding her church’s doctrine of marriage and modelling it to her subjects as a paradigm of duty and a metaphor of Christ’s relationship with his Church. She may be Queen and Head of State, but she has been faithful and obedient in her marriage even when Prince Philip has not treated her as Christ would his Church, with infinite loyalty and self-sacrificial love. For many today, this is too exalted an ecclesiology; too lofty, too ideal, too perfect for fallen humanity to attain. But The Queen and The Duke of Edinburgh manifestly have a high view of marriage as an honourable and sacrosanct estate: he is her strength and stay; she tolerates in abundance. There is nothing patriarchal or ‘abusive’ about this union: it is a partnership dominated by Christ, in unity with Christ, and they have been nurturing each other for 70 years ‘unto the measure of the stature of the fulness of Christ‘ (4:13). As society’s beliefs about and practice of marriage undergo incremental metamorphosis, it is worth remembering that marriage is eschatological and perfect as well as realised and partial: we eagerly await the Marriage Supper of the Lamb (Rev 19:6-9); ‘For in the resurrection they neither marry, nor are given in marriage, but are as the angels of God in heaven‘ (Mt 22:30). As we see more face to face, we shall know more of that community, that fellowship, that fidelity of love which marriage makes possible. But our vocation on earth is to confront that hardness of our hearts which nullifies God’s model for companionship and creation. Christian marriage is a mystery of grace. As a sacrament, perhaps it is already counter-cultural, endeavouring to resist those corrosive cultural influences, the ignorance, the unfaithfulness which seek to render it nothing more than a contract of the state. These are increasingly sensitive issues (..perhaps they have been for 500 years..), and pulpits often fear to preach marriage contention in the public discourse, and so the ignorance and unfaithfulness and ignorance of unfaithfulness perpetuates itself, and we see in mirrors even more darkly. But that is for another day. This 70th wedding anniversary is a day of congratulation and celebration. 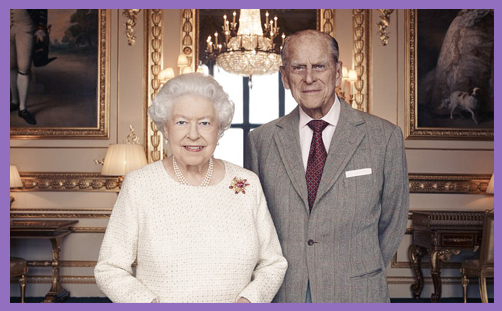 God bless Her Majesty The Queen and His Royal Highness The Duke of Edinburgh for making the metaphor of Christ’s covenantal love visible to the world for 70 years. Long may she reign.